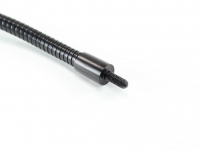 Main page » T-Slot Systems and Accessories » 10mm MakerBeam Profiles and Accessories » Assessories (MakerBeam) » Gooseneck, 200mm, 1pcs. The goosenecks literally provides more flexibility in helping you work on your electronics project. 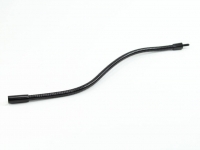 The gooseneck is 200mm in length. One end of the gooseneck has M3x0,5x7mm male threads, while the other end has M3x0,5x5mm female threads. 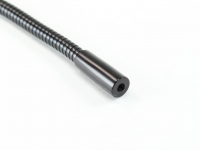 The standard m3x0,5 threads allow the gooseneck to be used with the PCBGrip system. The goosenecks will support 100 grams and are fairly obedient (gooseneck talk for they stay put after you bend them). When used with the PCBGrip system, the goosenecks provide 'helping hand' functionality for those hard to hold parts, while at the same time allowing you to rotate, twist, tilt, and raise the work.